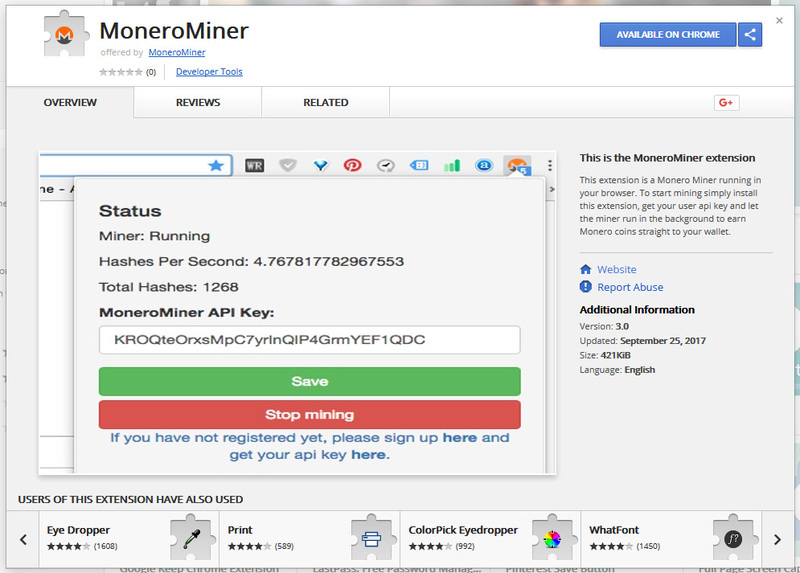 Another interesting project that is apparently based on the CoinHive Monero (XMR) WebMiner that we recently mentioned here – a Chrome browser extension for mining Monero. The MoneroMiner Chrome Browser Extension as the name suggests is a browser extension that works on Chrome and mines XMR in the background while the browser is running. The extension requires you to register on a dedicated website and generate your own MoneroMiner API key in order to be able to use it. It is an interesting application for using the web-based miner code, however not that practical as far as mining goes as the performance you will get is nowhere near what a dedicated miner is capable of delivering on the same system. It is much more viable to have the mining code run by a lot of users that are willing to support you this way that just to mine using a single miner on your own computer.